This is not a friendly shirt, nor is it morally excellent. I resent any parent who would put this on their toddler. 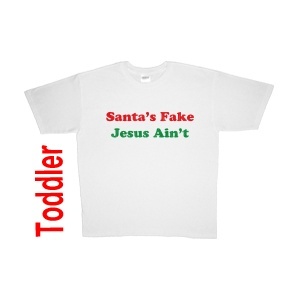 If you don’t want to do the whole Santa thing with your child on the grounds that it’s a lie, that’s fine, but don’t spoil the magic for other kids with this combative statement—all the more reprehensible in this size-2T form, for its forcing a two-year-old to be the killjoy, and an unwilling party in such ultra-conservativism. i would totally make my kid wear this, i like it a lot!